Today in forex trading The Forex Heatmap® had a buy signal on the GBP/NZD. The New Zealand Dollar (NZD) was mostly weak today in the main forex trading session. There was also consistent British Pound (GBP) strength and some US Dollar (USD) strength. This drove the intra-day movements and pushed the GBP/NZD higher and the NZD/USD lower for trading opportunities. The GBP/NZD is approaching one resistance leven, and the NZD/USD is approaching one support level, so traders should be scaling out lots. 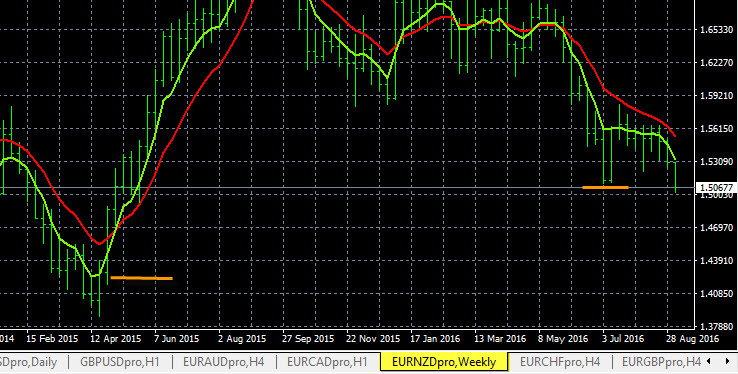 The AUD/NZD had a buy signal today on The Forex Heatmap®. This movement cycle originated in the Asian session with NZD (New Zealand Dollar) weakness and continued overnight through the main trading session. This pair is starting a new uptrend on the larger time frames and we will continue to monitor for new buy entry points in our trading plans and using the heatmap. The upside potential is excellent on this newly forming uptrend. The signals system you see below is The Forex Heatmap®, which provides live buy and sell signals for 28 currency pairs. Today in the forex market the NZD (New Zealand Dollar) weakness was present on all pairs. This drove the GBP/NZD and EUR/NZD higher in trading today. Both of these pairs are some what choppy but trending higher on the D1 time frame. We would consider a hold on these pairs if you bought them, as we believe the trends will carry them higher. The visual alerts you see below are from The Forex Heatmap®, which provides live trading alerts for 28 currency pairs.